No matter the sport you or your student-athlete plays, most likely speed is an important factor in its success. USAPersonalTrainers.com can help you gain the speed you need to be a top performer. 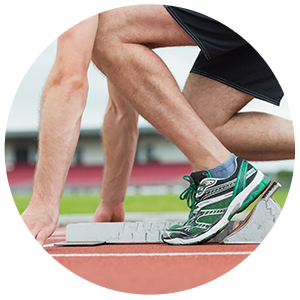 Form and technique are key areas of improvement, as they have a direct influence on your stride length and frequency. Through specific routines, Hank can help you work on those areas, as well as agility and power. Most sports require swift speed. Hank has experience and training that will help your overall athletic performance improve and help you gain the speed your sport requires. As a 39 year old amateur athlete, I have worked with Hank Drought for over 6 years. He has trained me during times of peak conditioning and in times of injury from soccer and injury recovery. Through all levels of my fitness Hank has a unique method of inspiring, motivating and pushing me to my peak athletic potential. His workout programs are fluid and he tailors them to keep them challenging. By working with Hank I feel that I have a much better understanding of my body and its athletic potential as well as its limits. Hank is a very responsible trainer and without yelling, screaming or pounding on me, he always is able to elicit my best athletic effort. He pushes both of us hard without being obnoxious. He has had a keen sense of our priorities — in my case: aerobic fitness, flexibility, strength — and continually fine tunes the program to better accomplish these goals. Perhaps most importantly, Hank’s deep and practical knowledge of exercise physiology has permitted him to design and adapt a rigorous program that avoids exacerbating various injuries or physical conditions that have afflicted us in the past. These have included joint and tendon problems, the beginnings of tennis elbow, some wrist issues, etc. Hank’s willingness and ability to work around these problems — and even to add elements to a program to improve them — has been a major plus for us. The Four Seasons Hotel Boston retained Mr. Hank Drought, as an independent contractor, to provide Personal Training services for our guests upon request. Mr. Drought consistently provided the utmost of professional service to our guests, always taking a personal interest in the well-being and safety of the client. His qualifications and experience in the field of Health and Fitness make Mr. Drought a valuable asset to any company. I’ve worked with Hank to improve flexibility, balance and coordination, for low back care and for several post-injury rehabs. Hank is always careful to coordinate with my physical therapist to ensure I’m doing appropriate exercises. Hank is a great motivator, both during sessions and afterwards. He designs exercise routines that I’m able to do between our one-on-one sessions and varies them periodically to keep me engaged. Hank is very talented in creating exercise programs that are both challenging and doable. I’d even say he makes exercising fun…almost! I feel incredibly confident with Coach Drought on my team. He has helped me increase my running speed, foot speed, flexibility and strength as an athlete; and I have definitely been able to make a difference on the field. After a knee injury in lacrosse, Coach Drought was engaged with my physical therapists during rehab and developed a program to get me back in condition and ready for football season. I feel 100% and can’t thank Coach Drought enough for getting me here. Our experience working with Hank Drought has been nothing short of remarkable. Hank has worked with our 13 and 15 year old sons for the past 3 years in football and lacrosse preseason training. The results have been amazing. Our boys have experienced Increased speed, agility, strength and overall confidence which have made a direct impact on their lives on and off the field. Hank has worked with the two of us for weight loss and personal fitness. He provided a personalized program we could use in our home gym to build on our work with him. Hank also helped us design our home gym so it would meet the needs of our entire family. If you want to work with a true professional who emphasizes form and safety, takes the time to understand your goals, establishes super-customized training programs and helps you achieve maximum outcomes, Hank is absolutely your man. Hank has empowered me and inspired me to make exercise a “must do” every single day. He absolutely knows the science behind exercise. And he is sincere in his desire to help me be my best. I would no sooner skip some type of exercise daily then I would forget to breathe. When I was 77 my daughters gave me a ‘life time’ gift of personal training with Hank. Now, 8 years later, his individually designed program has transformed me into an 85 year old who can do a 1 minute plank, all sorts of squats and balance exercises, strength and aerobic exercises – and long form Tai Chi. Fantastic! At 85 I owe my youthful vigor and independence to good genes, lots of broccoli and Hank Drought’s personal training in strength, endurance, flexibility and the body/mind balance of Tai Chi. And his encouragement to “Do what you can do.” Thanks, Hank! Hank utilizes proven methods of training and clearly communicates progressions and modifications of each exercise. I started seeing progress in my goals very soon after I began training with him. He not only trains but teaches me as an aspiring fitness instructor on how I can optimize my own performance and coach my students. Contact USAPersonalTrainers.com right away to find out how Hank can help you achieve your fitness goals with Speed Training services. What are you interesed in? Offering personal training and fitness instruction in Madison, Guilford, Clinton, Branford, Westbrook, Killingworth, Old Saybrook and the surrounding cities.